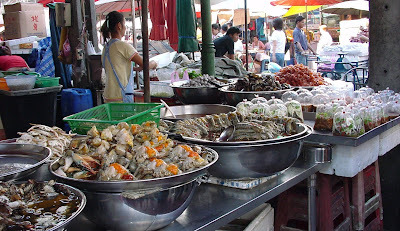 What kind of street food are you up for? 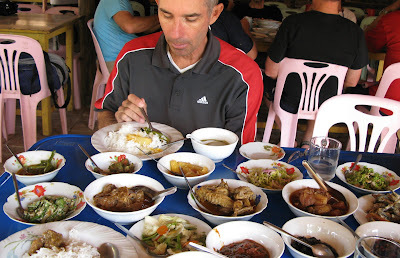 A typical family meal in Bagan, Burma. Just plop down your two bucks and you'll get a little bit of everything. All very tasty but don't ask to see the kitchen before you order. That's precisely what a German woman asked the waiter to see shortly after she sat down next to us with her husband. The waiter couldn't understand what she was asking for so she finally gave up. "I'm not eating, but my husband will. Just beer for me". The food came. She ate after careful inspection. 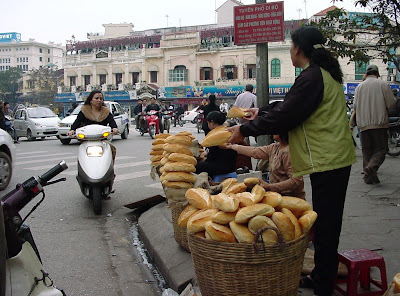 The French taught the Vietnamese how to bake bread and today in Vietnam, you can get the best French Bread in all of Asia. A beautiful thin crispy crust covering a soft, sweet, loaf. Excellent for sandwiches or just plain munching on. You say you're up for an ice cream sandwich? Well, in Thailand you'll get just that. Ice cream wrapped with what else but bread. And even green bread (as pictured above) if you choose. Or you can opt for the usual "Wonder type" bread. Chinatown in Bangkok is a place where you can get, among other things, practically anything you can eat (whether you wanted to eat it or not). Sauces and drinks are sold in little inflated plastic bags. Cheaper and easier to use than little plastic containers or cups I suppose but not any "greener" to use. In the evening as the shops begin to close, food stalls and restaurants pour onto the streets. Mm mm, Mm mm, Coconut. Really refreshing and only 20 Baht. 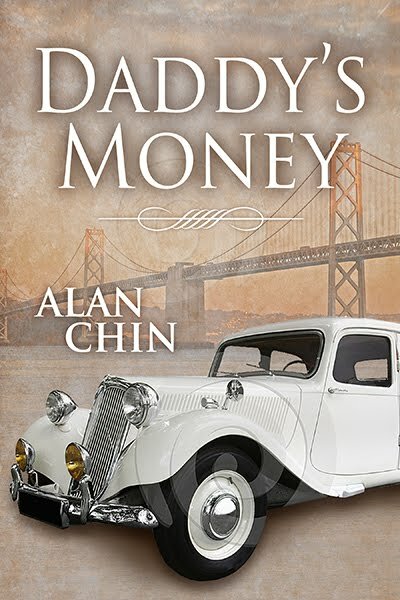 That's about 60 cents. You might not want Fluffy to see this one. 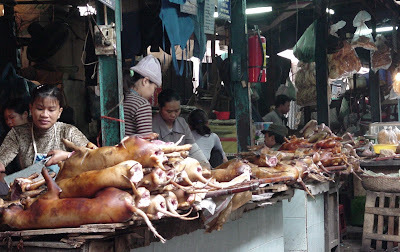 We thought they were roast pigs, but on closer inspection, they turned out to be roast dogs. 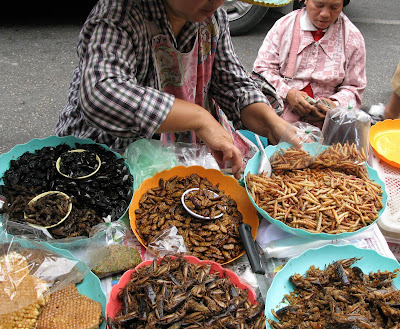 Crickets and Grubs. No we didn't sample any. Thais love deep-fried practically anything. Chicken is of course a favorite everywhere. 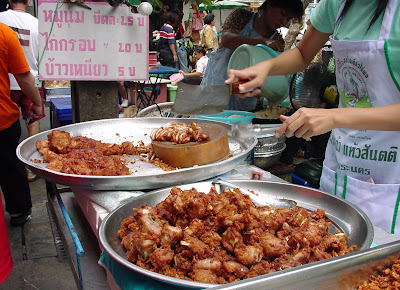 This is a typical street vendor selling fried chicken. It's not usual to see chicken, or anything else for that matter, frying away in a vat of hot oil on the sidewalk. Sounds like a disaster waiting to happen but I guess no more dangerous than trying to cross the street in Hong Kong. 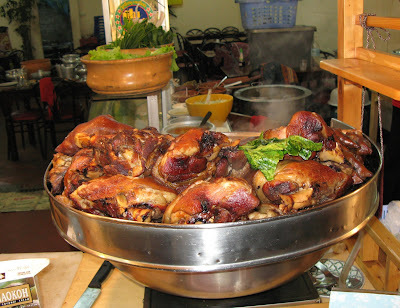 Marinated Stewed Pork Legs. As tasty as it sounds. 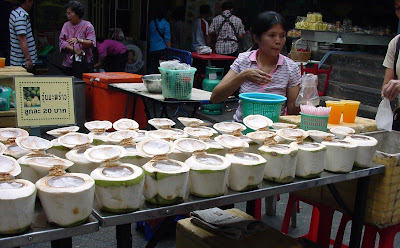 Actually it's very good and you can find it in back alleys all over Thailand. 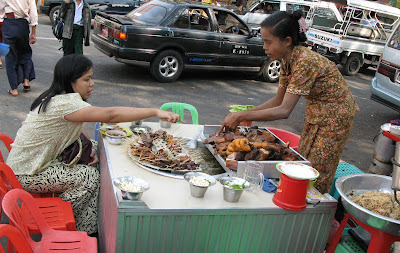 Here's a typical street stop in Rangoon. Just take a seat and point to whatever animal organ suits your fancy (all on skewers of course). Just warm it up in the vat of sauce and enjoy. 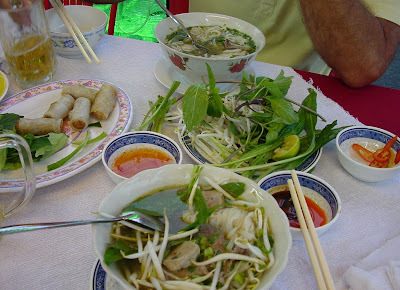 Pho on the street in Ho Chi Minh City. The secret is in the broth. If you're not up to snuff, you'll be laughed out of business on the streets of Saigon. About fifty cents a bowl but throw in the imperial rolls and a couple of beers and you're still only talking about five dollars or so, for two people.